Red yeast rice (RYR), also known as Hong Qu red rice koji or akakoji, red koji, red fermented rice, red kojic rice, red koji rice, anka, or ang-kak, is a traditional Chinese food that is fermented and obtained after red yeast (Monascus purpureus) is grown on rice. It was first described in the Tang Dynasty in 800 AD when it was used primarily as a preservative, coloring, and flavoring agent on fish and meat. It is made by fermenting white rice with the yeast, Monascus purpureus, which turns the rice a red color. The Chinese use Red Yeast Rice as a food preservative, a flavor enhancer, and a food-coloring agent for fish sauce, rice wine, red soybean curd, pickled vegetables, and salted meats. It has also been used in Chinese folk medicine for treating indigestion and diarrhea. In the USA, Red Yeast Rice has been used as an alternative to statin therapy especially among patients opposed to taking statins or who might be intolerant to standardized therapy due to statin-associated myalgia (SAM). Available as an over-the-counter supplement, several studies have shown RYR to be safe and effective in treating patients with mild to moderate hypercholesterolemia. Consumption of RYR has risen dramatically by almost 80 % in the USA from 2005 to 2008. The first use of Red Yeast Rice was documented in the Tang Dynasty (800 AD), when it was used primarily as a preservative, coloring, and flavoring agent on fish and meat. In the Ming Dynasty (1368—1644), RYR’s pharmacological use was recorded in the ancient Chinese Pharmacopoeia, Ben Cao Gang Mu-Dan Shi Bu Yi, to ‘‘improve digestion, spleen, blood circulation, and resolve blood stasis’’. This mold is still used mainly for coloring and flavoring properties, especially in many food industries in Asia. In Japan, Red Yeast Rice, also known as beni-koji, is used extensively in food coloring. Red Yeast Rice has also been used in countries such as China, Taiwan, and Philippines as a coloring and flavoring agent in food, as well as brewing wine and liquor. In the 1990s, many dietary supplement companies started to manufacture and advertise the use of Red Yeast Rice as a cholesterol-lowering agent due to its potential comparable effect to statins. However, it was not officially marketed until 2001 in the US. Nowadays, many commercially available Red Yeast Rice products are available around the world such as Red Yeast Rice supplement, Xuezhikang, M. purpureus rice, red mold rice, Cholestin, and HypoCol. 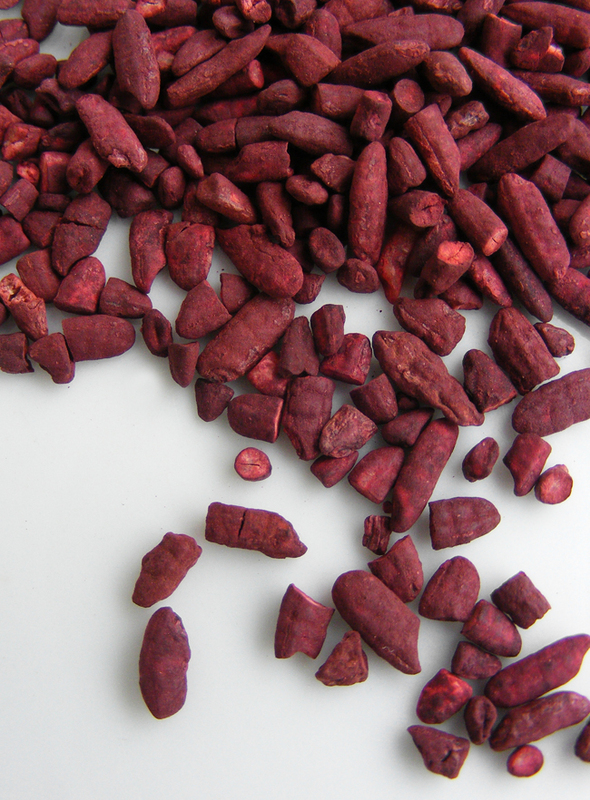 Red yeast rice is produced by cultivating the yeast strain Monascus purpureus on rice. The rice is first soaked in water until the grains are fully saturated. The raw soaked rice can then either be directly inoculated or it can be steamed for the purpose of sterilizing and cooking the grains prior to inoculation. Inoculation is done by mixing either M. purpureus spores or powdered red yeast rice together with the rice that is being treated. The mix is then incubated in an environment around room temperature for 3–6 days. During this period of time, the rice should be fully cultured with M. purpureus, with each rice grain turning bright red in its core and reddish purple on the outside. Mevacor. Since 2001, the FDA has required manufacturers to remove the monacolin K content from all Red Yeast Rice products, and it continues to be widely available to the public as an over-the-counter supplement. Some recently tested Red Yeast Rice products have been found to contain monacolin K in substantial amounts, and other products may contain little or none of this active ingredient. To avoid violating FDA policy, many commercial Red Yeast Rice products do not disclose the monacolin content on the package label. Therefore, consumers have no way of knowing how much active ingredient is actually present, leaving them unaware as to whether a particular Red Yeast Rice product is effective. Red Yeast Rice contains varying amounts of monacolins, a family of naturally occurring substances that inhibit hydroxymethylglutaryl-coenzyme A (HMG CoA) reductase, the rate-limiting step in cholesterol synthesis. 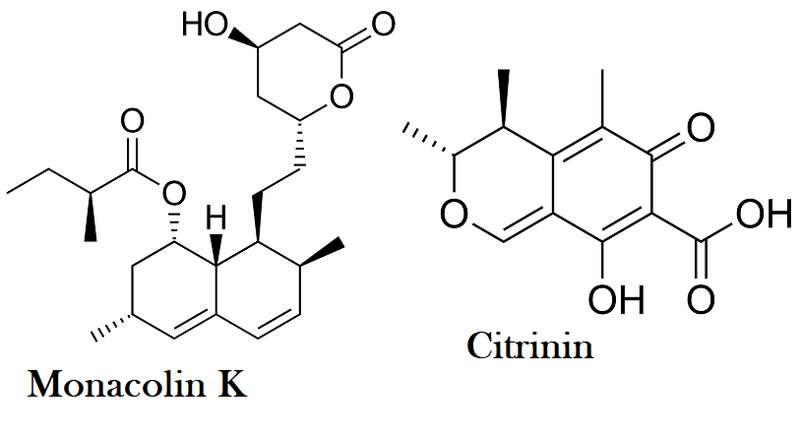 One such monacolin, monacolin K, is chemically identical to lovastatin.Approximately 90 % of the total monacolin content of Red Yeast Rice consists of monacolin K and its hydroxy acid form, monacolin KA. Other active ingredients with the potential to lower cholesterol in commercially available Red Yeast Rice products include plant sterols (beta-sitosterol, campesterol, stigmasterol), isoflavones, and monounsaturated fatty acids. In various populations, Red Yeast Rice has been shown to reduce low-density lipoprotein cholesterol (LDL-C) by 22 to 30 %. A greater reduction was observed in one trial when a more potent RYR product with a higher monacolin K content was combined with fish oil and lifestyle changes. Clinical trials have found that a relatively small dose of Red Yeast Rice (equivalent to a daily lovastatin dose of 5 to 7 mg) is as effective as 20 to 40 mg of pure lovastatin in lowering cholesterol. Little is known about the pharmacodynamics of the other monacolins contained in Red Yeast Rice, but it has been suggested that they may also have lipid-lowering effects or potentiate the effects of monacolin K.
A recent study demonstrated that the oral bioavailability and dissolution rate of lovastatin is enhanced when given as Red Yeast Rice, which may improve its efficacy. Several clinical trials have proven Red Yeast Rice efficacy in treating mild to moderate hypercholesterolemia. The total amount of Red Yeast Rice per day in the various trials ranged from 1200 to 4800 mg, generally divided into two doses. One randomized placebo controlled clinical study conducted on American patients showed that Red Rice Yeast decreased LDL-C levels by 39±19 mg/dL (22 %) in the Red Rice Yeast -treated group compared to 5±22 mg/dL (5 %) in the placebo group. There were no reported adverse events in either group. Participants received 2.4 g per day of Red Yeast Rice dose. In another study, researchers compared the efficacy of an alternative treatment which included Red Yeast Rice (Res-Q LDL-X, N3 Oceanic, Palm, PA), fish oil, and therapeutic lifestyle changes with simvastatin 40 mg per day in 74 primary prevention patients with known or newly diagnosed hypercholesterolemia. Each 600 mg RYR capsule contained 2.53 mg of monacolin K (lovastatin). Depending on baseline LDL-C, patients were given 1200 mg Red Yeast Rice (10 mg lovastatin) or 1800 mg (15 mg lovastatin) twice daily for a period of 12 weeks. All patients in the alternative treatment group (ATG) received six fish oil capsules. At the conclusion of the study, both groups had a similar reduction in LDL-C. LDL-C levels were reduced by 42± 15 % in the ATG and 40±20 % in the simvastatin group. Participants in the ATG, however, lost more weight during the study (−4.7±2.4 kg vs −0.3±2.2 kg) and had a significant reduction in triglycerides compared with the simvastatin group. A recent study tested the efficacy of a partially purified extract of Red Yeast Rice, Xuezhikang (XZK), in lowering non-high-density lipoprotein cholesterol (non-HDL-C) and LDL-C in patients with dyslipidemia. Patients were randomized to a placebo or one of two different doses of XZK, 1200 mg containing 12 mg of lovastatin or double the dose for 4 to 12 weeks. Treatment with XZK was well tolerated and resulted in significant reductions in both non-HDL-C (24 %) and LDL-C (27 %) compared with placebo. There were no differences between the Red Yeast Rice and pravastatin with regard to total cholesterol, LDL cholesterol, triglycerides or HDL cholesterol. Both products decreased total cholesterol, LDL cholesterol, and triglycerides levels in the approximately similar percentage of 23%, 30% and 8% respectively, and increased HDL cholesterol levels for about 4%. levels by 50.8% compared to simvastatin alone. The reductions in total cholesterol, LDL cholesterol, and an increase of HDL cholesterol were similar comapred to simvastatin. DIF1STAT is a patented dietary supplement containing 340 mg M. purpureus extract, 10 mg octacosanol, and 27 mg niacin showed a slight, but significant decrease in HDL cholesterol in the dietary supplement group while there was no difference in LDL, total cholesterol, or triglycerides compared to the pravastatin group. As a result of Red Yeast Rice containing Monacolin K (Lovastatin), thought to mimic the statin activity, using Red Yeast Rice as a lipid-lowering agent may also prevent morbidity and mortality caused by coronary heart disease. Although previous studies have shown an efficacy of Red Yeast Rice in controlling coronary heart disease risk factors such as dyslipidemia, there is no evidence regarding the relationship between Red Yeast Rice and controlling coronary heart disease events, which is obviously the most important outcome. It has been shown that Red Yeast Rice inhibits homocysteine-induced reactive oxygen species generation, nuclear factor-kappa B activation, and vascular cell adhesion molecule-1 expression in human aortic endothelial cells. Red Yeast Rice also effectively reduced endothelin-1 and C-reactive protein, while increasing flow-mediated vasodilation and nitric oxide. Current human studies regarding the use of Red Yeast Rice in diabetes is limited. In once observational study it has been shown that Red Yeast Rice significantly decreased fasting blood glucose in patients with or without hyperlipidemia compared to baseline. On the other hand no differences between the groups with regard to glucose tolerance has been found. Thus, the role of Red Yeast Rice in the management of diabetes is currently unclear. Red Yeast Rice has been shown to have other effects beyond dyslipidemia and CHD. In vivo and in vitro studies have successfully justified the possible efficacy of RYR in cancer, osteoporosis, non-alcoholic fatty liver disease, fatigue, and memory. However, more extensive human studies are necessary to confirm these results before they can be applied clinically in humans. 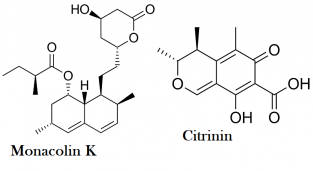 Monacolin K is identical to lovastatin, and therefore may present an increased risk of muscular and other side effects especially in patients with a history of statin-associated myalgia. Myopathy, hepatoxicity, and rhabdomyolysis have all been reported in patients taking Red Yeast Rice, as one would expect from any statin therapy. For this reason, Red Yeast Rice should be taken under the guidance of a physician who will closely monitor its efficacy, safety, and tolerability. Physicians should weigh the evidence before recommending RYR as an appropriate nonstatin therapy for their patients. Until the FDA regulates all over-the-counter supplements, including Red Yeast Rice, physicians and patients should be wary regarding their use. Since research into RYRE is in its early stages, experts still aren’t sure what the ideal dose should be. The amounts taken in some studies have varied from 1.2 to 2.4 grams per day. In China and other countries, estimates of average daily consumption are much higher. Keep in mind that the amount of monacolin- perhaps the most important ingredient – in a Red Yeast Rice extract can vary a lot. There are many different strains of the yeast. Different types of fermentation are used. One study of different brands of red yeast rice supplements showed that the amount of monacolin ranged from 0% to 0.58%.